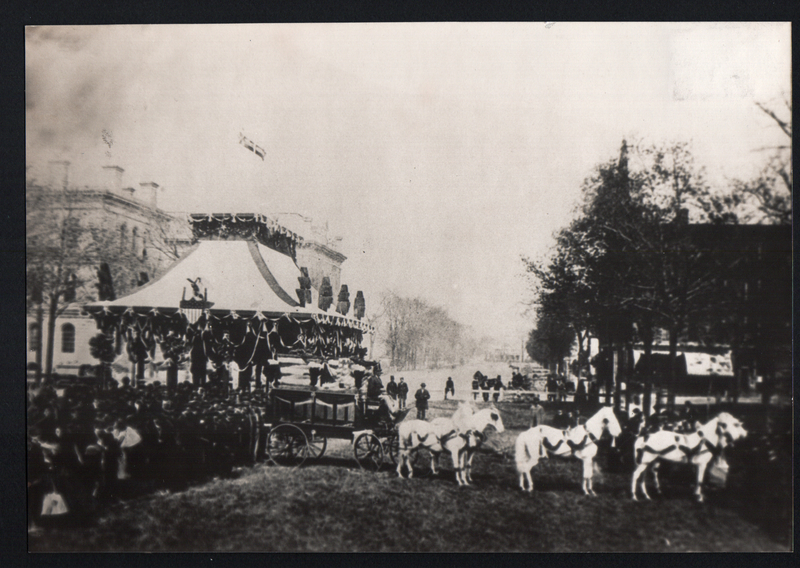 B&W photograph of Lincoln catafalque and horse-draw hearse on Public Square in Cleveland, Ohio, on April 28, 1865. The view is looking east with Superior Avenue in the background. The slain President's was on view for the public all day. Mourners waited in line, surrounding Public Square, for hours to view the open casket. It was estimated that over 60,000 people viewed Lincoln's body that day. www.wrhs.org; portrait files for Lincoln, Abraham, folder Obsequies. For personal and research reference only; republication or reproduction requires written permission from the Western Reserve Historical Society, Cleveland, OH.